Should you use an exfoliating spin brush for acne? 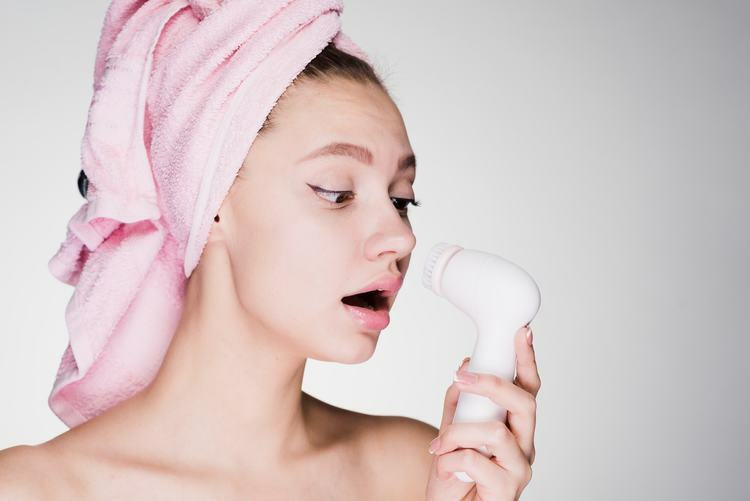 Ultrasonic and exfoliating facial cleansing brushes (like the ones by Clarisonic, Vanity Planet, and Clinique) have been all the rage in recent years. We get it…they seem like a good idea. Dentists recommend electric toothbrushes to clean your teeth better, so wouldn’t the same logic apply to your face? Not exactly. These brushes provide intense exfoliation and when used improperly (or too often), they can strip the skin of its natural, protective layer, leading to over dryness and irritation...ultimately making acne worse. If you struggle with acne or even occasional breakouts, you may want to read the below before your next “power wash”. 1. Consider your acne severity: If you have moderate to severe inflammatory acne, never use these brushes. They will be too irritating, damage the outer protective layer of your skin, and make your acne worse. 2. Choose the right brush head: Use a brush that has longer, softer bristles for (ex. The Clarisonic Acne Brush Head for sensitive, acne-prone skin), which will be more gentle on your skin and reduce the likelihood of negative side effects. 3. Mind your technique: Don't press the brush too hard into your face. Gently gliding the brush over your skin will have enough of an effect... you do not want to overdo it! 4. Use it sparingly: Never use these brushes more than once a day or you'll exacerbate the oil production of your skin. In fact, 1-2 times/week should be your maximum usage. 5. Clean carefully: Good hygiene is critical with any facial tool or product. These brushes are a “perfect” reservoir for dirt and bacteria. If not cleaned properly they can create a perfect storm for more acne by creating small tears in the skin and inserting bacteria (yikes!). Clean your brush thoroughly after every use by under running water + do a deeper clean by leaving it in alcohol for a few hours every week. TL;DR—though these brushes are heavily promoted by brands and beauty influencers, they may be doing more harm than good. Instead, using a good, medicated cleanser with your bare hands will do a better job at treating and preventing acne when used with the right acne treatment cream and moisturizer. Learn more about how to treat and prevent acne by clicking here.